In the summer of 1999, as the German KFOR soldiers in Kosovo settled in their barracks, they turned on the radio to the program "Radio Prizren". Every evening, the station broadcasted the three-hour program "Radio Andernach" from the German army's radio station "Soldiers for Soldiers". News from back home and all the current hits. 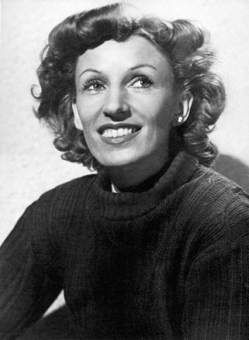 One evening, a smoky voice from the past came through the radio: Lale Andersen sang "Lili Marleen". The film portrays more than just the life story of the singer, it traces the phenomenon of "Lili Marleen" and the resulting legend. What was the mix of talent, luck, Zeitgeist and decline that made Lale Andersen world-famous with one song? What is the source of the fascination with the song that, even today, moves the hearts of soldiers? Legend and reality - for behind the singer's glowing star façade hid a person full of contradiction and inner tragedy. Irene Langemann was born in the Omsk region of the Soviet Union in 1959. She studied Acting and Germanics at the Tcepkin Theater Academy in Moscow. From 1980-1990, she worked as an actress, director and theater writer in Moscow. In 1983, she began moderating and directing for Russian television. In 1986, she became a director and scene editor at the Nasch Theater in Moscow. She moved to Germany in 1990 and was an editor at Deutsche Welle TV in Cologne until 1997. Since 1997, she has been working as a freelance filmmaker. A selection of her films includes: Nirgendwo verwurzelt (1993), Die Goetter bitte ich um eine Aenderung (1994), Imperium der Traeume (1996), Auf Wiedersehen in Berlin (1997), Zwischen hier und dort (1997), Das Ende einer Odyssee (1998), Klasse(n) Klaenge (1999), Fit fuer Leben und Arbeit (2000), Russlands Wunderkinder (1998-2000), Lale Andersen: The Voice of Lili Marleen (2001), Martins\' Passion (Die Martins Passion, 2003), Ices and Oranges (2004), Vodka, Art, and Fashion (2004), Goldap - In Polish Siberia (2005), and Rubljovka (2007).